"Coming off a difficult, emotional, last minute loss to Mansfield in last week’s title showdown, there was concern that King Philip may have a letdown against Thanksgiving Day rival Franklin. Both teams came into week five with one league loss and a setback on Friday night at Macktaz Field would effectively end that team’s chances of a league title this season. 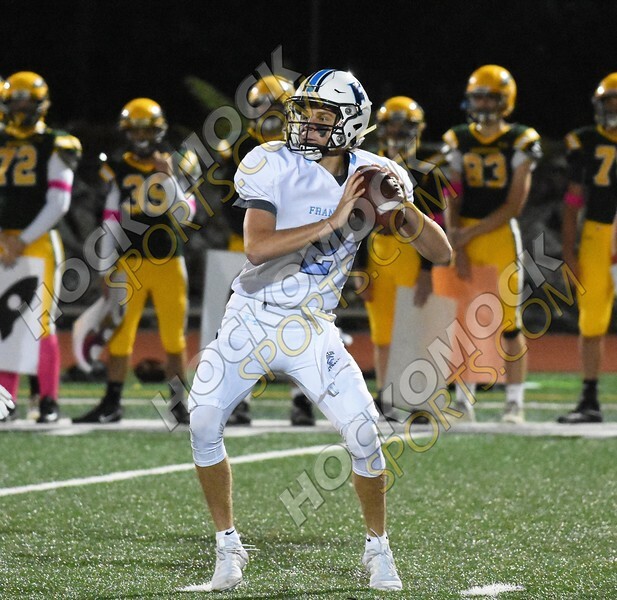 KP beat Franklin 35-14 behind three touchdown passes from junior quarterback Robbie Jarest to earn its 13th straight victory in this series dating back to Thanksgiving 2009 and to stay just one game back of Mansfield in the division standings." For a photo gallery from this game. – Cassi Ronan set up a pair of goals in the first half and the Panthers scored two more in the second half to beat Attleboro. Ronan assisted on Regan Paterson’s goal that put the Panthers up 1-0, and then set up Victoria Quinn as Franklin took a 2-0 lead into half. Sara Carney and Stephanie Bell each scored unassisted goals in the second half and Anna Jardine made four saves in goal for the shutout. – Franklin defended its home course against non-league foe Medway on Friday afternoon. Quinten Faro paced the Panthers with a team-low round of 40 while Matt D’Errico and Jack Paterson each shot a 41.